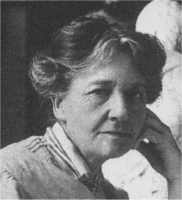 Sophia Rosamund Praeger was born in Holywood, County Down, daughter of Willem Emilius Praeger, a Dutch linen merchant who had settled in Ireland in 1860, and Marie Patterson. She had five brothers, of who Robert would become a distinguished naturalist. Within months of Rosamund’s birth the family moved to Woodburn House, Croft Road, Holywood, where they had as a neighbour Rev Charles McElester, a Non-Subscribing Presbyterian minister who ran a day school in his church. Rosamund both attended this school, and later taught there. She received her secondary education at Sullivan Upper School, Holywood, the School of Art, Belfast, and the Slade School, London. Before returning to Ireland to open a studio in Belfast and then in Holywood, she studied art in Paris. She wrote and illustrated children's books, but achieved fame with her sculpture “The Philosopher” which was exhibited at the Royal Academy, bought by an American collector, and is now on display in the Colorado Springs Museum and Art Gallery. She mostly worked in plaster, but also used stone, marble, terracotta and bronze, and her work included relief panels, memorial plaques and stones. She exhibited in London and Paris, at the Royal Hibernian Academy, as well as at the Irish Decorative Art Association Exhibitions. She was a member of the Guild of Irish Art Workers. Among her other works are “The Wai”; “Johnny the Jig”; “These Little Ones”; “St Brigid of Kildare' and “The Fairy Fountain”. For the Causeway School near Bushmills, County Antrim, she carved 'Fionnula the Daughter of Lir' in stone. She modelled a heraldic figure for the Northern Bank in Donegall Square West, Belfast, and bronze plaques for the front door of the Carnegie Library, Falls Road, Belfast, as well as the angels on Andrews Memorial Hall in Comber, County Down, and some work in St Anne's Cathedral, Belfast. She illustrated three books for her brother, Robert Praeger. She was President of the Royal Ulster Academy, an honorary Fellow of the Royal Hibernian Academy, and she received an honorary doctorate from Queen's University, Belfast. In 1939 she was awarded the MBE. She maintained her studio in Hibernian Street, Holywood, up until 1952, at the age of 85. She died at Rock Cottage, aged eighty-seven years and two days, and was buried in the Priory Cemetery.